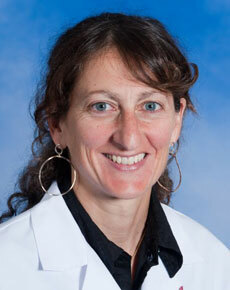 Dr. Morganti began her private practice career in September 1999 after earning a sports medicine fellowship from Johns Hopkins Hospital in Baltimore in July 1999. Her medical school and internship was completed at the State University of New York Health Sciences Center at Syracuse. After a year of research at Tufts University in Boston, Dr. Morganti completed her residency in orthopaedic surgery at SUNY in 1998. During residency she studied strength training and aging and its effects on bone density, muscles and balance. Dr. Morganti was Board Certified in July 2002 by the American Board of Orthopaedic Surgeons. Dr. Morganti's memberships include the American Medical Association, the American College of Sports Medicine, the American Orthopaedic Association, the Arthrosocopy Association of North America, and membership in process with the American Orthopaedic Society of Sports Medicine. Research projects, and presentations during residency included: "A Survey of Master Runners"; "Effects of Gymnastics activity on Bone Density in Prepubescent Girls"; "Soft Tissue Metastases"; and "Return to Play and Cervical Spine Injury". Amongst her publications are: "Return to Play after Cervical Spine Injury" - Spine - Vol 26 No 10, 2001, and "Saphenous Neuritis, a Poorly Understood Cause of Medial Knee Pain", Journal of the American Academy of Orthopaedic Surgeons, March-April 2002. Dr. Morganti is a decorated runner. She provided physician coverage for the Senior Games track and field events in NY in 1995. She is herself a gold medalist having won the 5000m at the Empire State Games in 1992, and also a silver medalist for the 5000m two years later in 1994. Other running honors include 1st place at the Corporate Challenge events in Syracuse in 1992, 1994 and 1995, and receiving the Syracuse Chargers Outstanding Distance Runner award in 1990, 1992, 1994 and 1995.